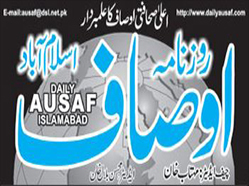 Daily Ausaf Epaper is a urdu newspaper from Pakistan, it covers important and latest news from all over the world. Ausaf epaper is published from Lahore. Daily Ausaf newspaper Lahore is Urdu language newspapers with multi level news for all kind of interests. Ausaf epaper is comprise of 22 news pages with lot of information for you. Sports, politics, weather, local, international news and showbiz news are included in this newspapers. This newspapers was originated by Professor Muhammad Javed Amin. Roznama Ausaf Chief editor is Junaid Saleem. And Hifiz Muhammad Iqbal is the eiditor of Daily Ausaf Urdu Newspaper. You can read online Daily Ausaf Epaper on dailyepaper.pk. Dailyepaper.pk is a free source of daily epapers of top Pakistani Urdu & English newpapers to read online. Access Daily, Weekly & Monthly Akhbar of all cities Edition like Lahore, Karachi, Islamabad, Quetta, Multan, Peshawar and Rawalpindi. Give your Feedback about Daily E-paper PK to us.